That's right - I'm a reluctant Fall Nester! That doesn't mean that I don't like Fall - I do. I love all the warm and cozy colors and the wonderful smells. I'm reluctant because it's hard to wrap my mind around Fall when it's over 90 degrees outside and because I am lacking in decorating skills. I get inspired by all of you, but don't really have the right items and don't know how to put them together very well. I was thinking about this in the morning and wanting to find a way to be part of this Fall nesting thing. I was headed to my favorite thrift store to get my son some extra school clothes and decided that I would keep an eye out for anything that inspired me to create Fall loveliness. On a side note, I spent $25 at the thrift store, which sounds like a lot to me, but I got: a purse, a table runner, 6 vinyl placemats, a package of floating leaf candles, a cake/dessert stand, a metal pot, a ceramic bowl, a vase, 3 boys short-sleeve shirts, 5 boys long-sleeve shirts, and 3 pair boys pants. Woo-hoo! OK, that means that I have no creativity left for the week! My Starbucks even got into the spirit of Fall nesting today by featuring their pumpkin lattes and pumpkin loaf slices. And now they have oatmeal (which is warm and cozy, just like Fall). Not that I was there. In honor of Fall nesting, I want to have another theme week (Summer Campout Week was so much fun!). Lord willing, it will be the first "official" week of Fall - 9/22 through 9/26. It will be a week of yummy pumpkin recipes ('cause I do like pumpkin almost as much as chocolate)! There will be recipes for you, opportunities to link up, random pumpkin information, and a giveaway! Check back for more details. 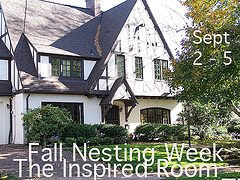 All this nesting is happening because of Melissa at The Inspired Room. It's Fall Nesting Week at her place with lots of great resources, people linking up, and even a giveaway! Be sure to stop on by. You should also stop by my friend Rhonda's blog: Scooterblu's Whimsy. Not only is she a great Fall nester, but she is celebrating her 100th post and having a lovely Autumn giveaway! I think you did a great job my friend. I don't start decorating for fall until around October. We are too busy dodging hurricanes in September lol. I LOVE pumpkin too. Pumpkin pie, pumpkin spices, pumpkin bread, pumpkin scented candles, etc. I LOVE pumpkin! Can't wait to see what you bring to the "table". Great haul at the thrift store! I think you're doing a fine fall decorating job! Simple is best. 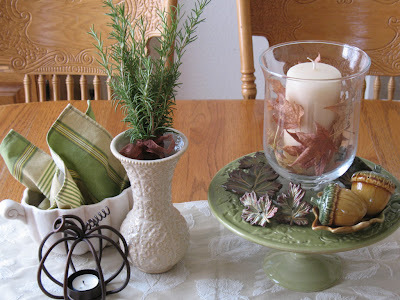 You found some really nice things--I like the colors & the leaves in the hurricane vase especially :). Hi! I think you've done an excellent job. I live in a tropical place too and it's still over 90 degress, but I cranked down the AC and started pulling out my pumkins (fake ones, of course!). I think you got a lot for your money, too! Don't you love thrift stores! Well you look pretty creative to me! Good for you, thank you for getting inspired and taking part in the festivities. I'm so glad you did! 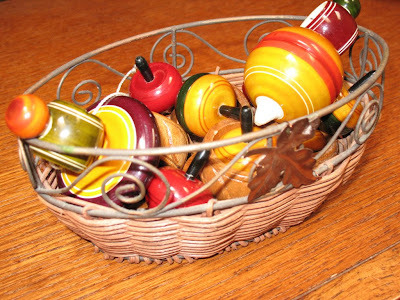 i just love those ceramic acorns....so cute!! You so spaved at the thrift store!!! Love your version of early fall decor. OH LOVE IT!!!! Cute ideas....great decor! I know, it's weird thinking that it is Fall already, what happened to summer already??!!! Love the items in the basket! Great idea and inspiration! That's a fab start! Like it all!